TT #68 CO, Smoke, and LP Detector Replacements -- Could save your life! A number of issues have focused me on safety recently. Obviously, the death of three people referred to in the last TechTip (#67) article was one factor. Another is a recent injury I suffered while standing on a RV step ladder and falling off resulting in a broken collar bone, and necessitating surgery to install a plate to put the bones back together. It was a simple accident with long term consequences. The third is the fact that we for some time now I have been sharing some knowledge at Rally Seminars that I wanted to share with a wider audience. Did you know that the Smoke, LP/Propane and CO Detectors require routine replacement? The recommended time line is five (5) years. You might question why is this replacement necessary? According to the Detector makers, the sensor component ages and can become unstable, reducing its ability to accurately warn of impending danger. My first exposure to this need was while I had my coach stored in an enclosed building. Our RV was stored in a farmer’s equipment storage building and one day the farmer was moving a lot of his equipment using his diesel tractor inside this building. Upon entering my RV to take it out on a trip the next day, I discovered that the CO detector was continually warning of excess CO. By that time there was no danger, however the sensor had been contaminated. The only solution was replacing it. When I installed a CO detector in my residence I noticed a yellow warning sticker stating that the detector must be replaced by a date in 2014. The instructions accompanying it were very clear that the sensor would deteriorate and that a complete replacement was required in 7 years from the date of manufacture and that this date would be noted on a label on the edge of the detector clearly visible without removing the detector from its mounting surface. That got me thinking about the smoke and LP/Propane detectors. Sure enough, they also had a "Best Before” date! It is generally recommended that these detectors be replaced in the five (5) to seven (7) year from the date of manufacture, which date must now be stamped on the detector. Since these detectors are built in batches and the RV makers buy in quantity, the generally accepted time frame for replacement is five (5) years. 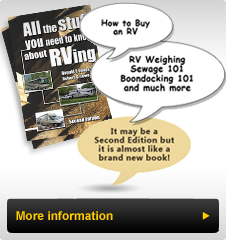 These components can be purchased at RV dealers nationwide. It is critical to ensure that the replacement is designed and be designated for use in an RV. These versions are more vibration resistant and their sensors are suitable for the wide variety of gases prevalent in a RV that would not be present in our residences. Lastly while some may be battery operated, most have the ability to operate on the RV 12volt system. On Fleetwood RV’s the CO and LP detectors often operate on the coach 12 volt battery system. The LP/Propane detector is often powered by both the 12 volt coach and 12 volt chassis system. This provides the optimum safety protection, since the system is activated as soon as the battery disconnects are activated to use the RV. On some older RV’s the Original Equipment Maker may no longer be in business. Suitable replacements will be available, however they may not be "plug and play” replacements. They may need to be wired to the existing RV wiring. I recommend that if the LP detector was powered by both 12 volt systems and the new detector is designed to be powered by only one (typically the Coach) 12 volt system. Simply install a 6 watt diode in each power source with the band on the diodes toward the detector. (See diagram) This will maintain the integrity and safety of the original design. Check your detectors, replace them if required and enjoy you RV with the protection that was designed into it.